Combining the taste of chocolate and orange in a smoothie is a match made in heaven. The chocolate and orange combo isn’t quite as popular as chocolate and cherry or chocolate and raspberry, but it’s definitely in the same league of tastiness. This is one of those smoothies that qualifies as a dessert, albeit a healthy one. What health benefits do the ingredients of this smoothie have to offer? Let me tell you. Cacao (raw chocolate) is an excellent source of magnesium and vitamin C, high in antioxidants, and good for your heart, brain, and teeth. It also contains nature’s feel good chemical, the amino acid tryptophan. Oranges are also high in vitamin C, and a good source of potassium, folate, and vitamins A and B1. These vitamins and minerals along the other phytonutrients in oranges provide antioxidant properties, support a healthy cardiovascular system, and protect against certain types of cancer. Add in a little avocado and vanilla, and you’ve got one delicious and nutritious smoothie. Enjoy! Add the ingredients into your high speed blender and blend for anywhere from 30-45 seconds or until the desired consistency is reached. Please leave a comment below if you try this decadent chocolate orange smoothie or have a similar recipe of your own. Happy Blending! The membranes and pith of whole citrus do a number on my innards, and I admit I can be a bit lazy about segmenting oranges to avoid the membranes (it’s quite messy and tedious) or pushing the whole thing through a strainer (ditto) so instead of the two oranges I toss in a ~12-oz container of mandarin oranges packed in water or juice. I usually don’t need the water. I usually keep a jar stashed in the back of the fridge to make this or a “Creamsicle” smoothie with Greek yogurt. 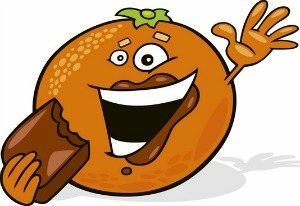 I grew up with chocolate oranges at Christmas and chocolate-dipped candied orange peel whenever I could get it (loved that combination of bitter and sweet) so I’d MUCH rather have chocolate-orange than chocolate-mint or chocolate-raspberry. I’ll have to get back to you with a proper recipe for the “Creamsicle” after I can get to the store for more mandarin oranges. It’s currently a “spoonful of this and a slosh of that”, which is how I make most of my smoothies, so I’ll have to make it again (oh, such suffering!) and measure things out properly. Thanks, Mary. I remember the days of meticulous measurement when first starting on smoothies :) If it would be easier to just provide the ingredients I can take it from there. If you’re REALLY organized, you could drain the oranges ahead of time, lay them out on a pan lined with wax paper, and freeze them, and freeze the juice in an ice-cube tray. I’ve only done that once and it came out especially good, but it was kind of a pain in my crammed freezer. Lots of things get lost in my overflowing inbox ;) Thanks so much for the detailed instructions for this delicious sounding smoothie, Mary. I’m definitely going to give it try soon. Cheers! Yum! I made this thinking afternoon snack… But my zeal for add-ons turned it into more of a light dinner :) I skipped the vanilla and sweetener, then added 1 Tbsp of flax seeds, 1 Tbsp of pumpkin seeds, and fresh ginger (roughly 1/4 inch). I fought my inclination to add soy milk, and chose the seeds instead. Very tasty! Ryan, you have gotten me hooked on using avocados in smoothies and I love it! Frozen blackberries, yum, haven’t had those in a while. Glad to hear I’m not only one with an avocado addiction :) Thanks for sharing another delicious version of this smoothie! Using cacao instead of unsweetened cocoa powder wouldn’t have altered the taste much. Sounds like you needed sweeter oranges and/or a little more sweetener to achieve a more palate pleasing, dessert like smoothie.